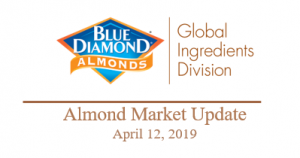 The March Almond Board Position Report shows the 2018 crop harvest at 2.265 billion lbs., with receipts not moving materially off the February number. Overall shipments of 184.9 million lbs. were, as expected, within 5% of the prior year. New commitments of 149 million lbs., in an active March, exceeded the prior year by 37 million lbs. YTD shipments are 1588.9 million lbs., off of last year by 1.7%. The domestic market remains at 3% ahead of prior year, with export markets off by 3.65% combined. Remaining commitments are 5% ahead of last year. With a slightly smaller overall supply, the combination drops uncommitted 2018 inventory at the end of March below last year by 5% or 26 million lbs. less. In reviewing worldwide shipments there are no surprises. North America shows modest gains with an increase of 3% over last year. As anticipated, China shipments are now down 31% as this market suffers under the current trade war between China and the US. The industry is watching closely the reported progress in current trade talks and hoping for some resolution in the near future. If this were achieved China would be coming back to California for additional almond requirements. In the mean- time, Australia is filling the void. India shipments are on par to last year as expected with more demand for the remainder of this crop year due to an early Divali next fall. The Middle East has recovered after a slow start and is now well stocked for Ramadan. Western Europe is down 7% with Germany leading the decline but also seeing bright spots as in the Netherlands. Europe now needs to consider coverage for the spring and summer to take care of fall demand as pollinator replenishment will not be available for another 6 months. Barbados gets the award this month as the fastest growing market …up 3,760%! Pricing since January has reflected an outlook pointing towards a tight transition and late season supply shortages. The results through March continue to point strongly in the same direction. Ending inventory is tracking to a similar position as last year in the 350-360 million lbs. range. That will occur if there is no growth in shipments April through July compared to last year. As early season estimates began to be published (e.g., Vinsight, TNT) the crop range being discussed is in the range from 2.4 billion to 2.55 billion. These estimates reflect a view that the 2019 bloom was still a bit weather challenged, though better than the past two years. 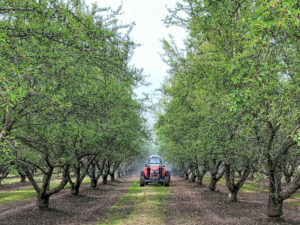 On April 24, NASS will release their almond acreage update and on May 10, the NASS Subjective Estimate will be added to the conversation. The 2018 ending inventory will be stretched to meet demand, particularly in pollinizer varieties. Again, consistent strong demand matched against a supply that is 30 million lbs. smaller than last year has created firm and stable prices since January. Those wishing to secure pollenizers and manufactured goods would be well advised to find coverage soon.